In the last days, some customers of Delegate365 experienced a warning in the Delegate365 portal that informed about the failing communication to Exchange Online. This issue was caused by the Microsoft Exchange Online PowerShell endpoint. We are glad to announce that this issue should be fixed soon. Delegate365 informed users about the reduced functionality with a message “Access denied – please check the credentials of your Office 365 account…” when opening the yellow warning icon in the portal. At atwork we were concerned about this issue since we were using exactly this service which was working properly since years and there has been no change on our side. We started doing research, checked our code, made tests in various regions and Office 365 tenants and tried to figure out if there is any solution for the problem - with various results. In the end, we found out that the results were absolutely unpredictable and more or less random. There’s one related thread in social.technet.microsoft.com Exchange Online error: Identifier is not in a valid session state on the remote computer where we saw that more users were affected by this issue. We contacted Microsoft and continued to seek for a solution. EX116717 - PowerShell issue: User Impact: Users may be unable to perform administrative actions when using Remote PowerShell commands. 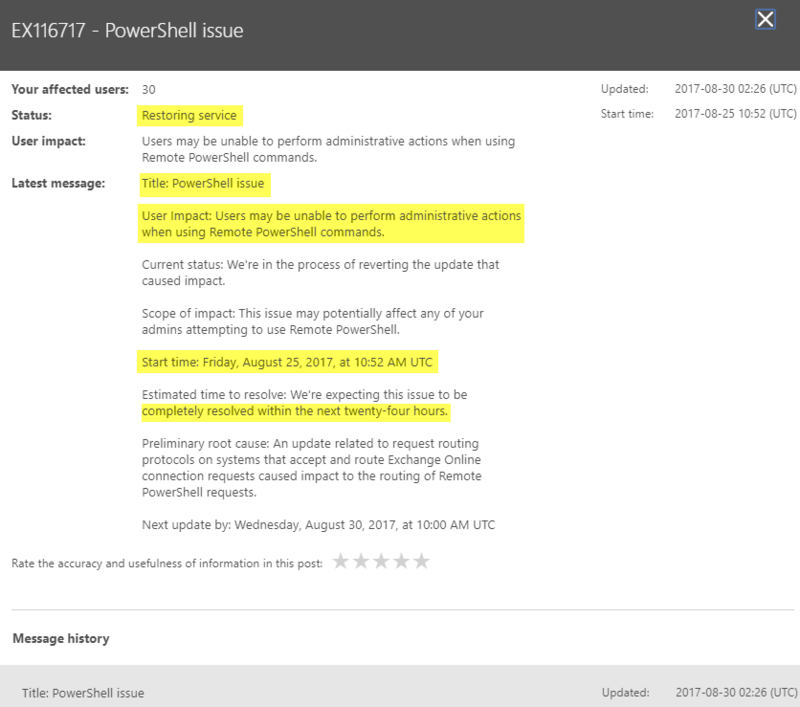 The PowerShell issue started by Friday, 25th August 2017. The status says “Restoring service” and Microsoft expects this to be completely resolved within the next 24 hours. The PowerShell connection issue was caused by an update that was deployed in Microsoft Office 365 Exchange systems. So, we hope that the Exchange PowerShell service will be working properly in all tenants again soon (in the next hours). On the Delegate365 side, there will be no changes. Once the service is completely available again, the next Delegate365 sync operation will update all deltas again and the warning message will be removed in the Delegate365 portal. Thanks to all customers for your understanding. The good news is that the services will be fixed soon and Delegate365 will work properly again!